Indeed, when it comes to the Middle East, it seems that most Americans, perhaps unknowingly and unintentionally, perceive the entire region and its people as "one great, blooming, buzzing, confusion," a dangerous place. Having been disturbed by the stereotyping not only of Iranians, but of other ethnic groups, for the past several years, I have written and lectured about image and perception vis-a-vis representation of the Middle East, Islam, and particularly of Iran. In fact, my recent book, The U.S. Media and the Middle East: Image and Perception (Praeger, 1997; Greenwood, 1995), attempts to explore some of the disturbing ramifications of portrayals of the Middle East by the U.S. media. Of the 16 chapters, written by 22 scholars, five are specifically about Iran and Islam. From this perspective, in this essay, I will briefly illustrate the ways in which Iranians are portrayed by the U.S. media, mainly through motion pictures, and discuss some of the consequences of this often neglected or overlooked matter. Since the 1979 Iranian Revolution that resulted in the overthrow of the Pahlavi regime, the establishment of an Islamic Republic, and the hostage-crisis, Iranians in Diaspora, particularly those of us residing in the U.S., have been singled out for negative stereotyping by the U.S. media and Hollywood. In contemporary societies, mass media, particularly the visual media, are extremely powerful. In fact, their collective power surpasses family, religious, educational, and other traditional institutions. According to Jane Campbell (1997), "while teachers and professors struggle to educate themselves and their students about the worlds beyond. . .they also must face the fact that the daily barrage of images and information emerging from the media may not only underscore but may also counter, reverse, and overturn the enlightenment gained inside the classroom" (p. 178). In this so-called "Information Age," the U.S. media play a powerful and decisive role in the enhancement or destruction of images of other peoples, places, religions, and nations of the worlds. For the first time in human history, the first stories that children hear are told by television not by parents. George Gerbner (1996) writes: "A child today is born into a home in which television is on an average of over seven hours a day. For the first time in human history, most of the stories about people, life, and values are told not by parents, schools, churches, or others in the community who have something to tell but by distant conglomerates that have something to sell" (pp. 28-29). It is within such a cultural milieu that I would like to share a few disturbing instances of U.S. media portrayals of the Iranians. First, let me provide a brief profile of the Iranian-American community in the United States. According to official 1990-91 estimates, reported by the U.S. Census Bureau, over 220,000 Iranians reside in the U.S. However, unofficial estimates suggest that there are over 200,000 Iranians in Los Angeles, California, alone, and, overall, there are nearly 1,000,000 Iranians (first and second generations) in the U.S. According to the Census Bureau, Iranians in America are richer, better educated, and have a lower criminal record than other Americans. Furthermore, proportionally, Iranians have six times as many doctoral degrees as Americans. The average Iranian family in the U.S. is almost 20% richer than the average American household. About 29% of all workers in America hold blue collar jobs. But only 12% of Iranian-Americans hold such jobs (Iranians richer , 1994). Although successful and contributing Iranians can be cited in practically every profession in the U.S., I single out Dr. Jamshid Ghajar of the Aitken Neuroscience Institute in New York, whose pioneering surgical procedure on head injuries has resulted in worldwide media coverage, as just one example. In fact, Nova, a highly respected television series on the American Public Broadcasting System, featured Dr. Ghajar's work in a one-hour episode called "Coma." Nonetheless, during the entire program, there was no mention of him being Iranian! The Iranians in general and the Iranian-American youth in particular, should take pride in having so many excellent Iranian role models in the U.S. Furthermore, they should be proud of their immensely rich cultural heritage. The problem, for the Iranians, particularly the second generation, is that what they and their American friends or schoolmates are most often familiar with are the negative stereotypical images of the Iranians in the media. In such a milieu, it is common for many Iranians, especially the youth, to reject their own self-identity and heritage in an attempt to "fit in" or to avoid being ridiculed by their friends. Prior to the Iranian Revolution of 1979, Americans knew very little, if anything, about Iran. If asked, they could not even place Iran on the world map. However, a few had heard of an exotic, faraway, fairy tale land, called Persia. (In fact, many still do not equate Iran with Persia). Persia was also associated with Persian Cats, Persian rugs, Persian pistachios, Persian princes, and Persian melons. Then, and even now, most Americans did not know that Iran is a non-Arab country and that Iranians speak in Persian or Farsi, not Arabic. Prior to 1979, they had not even heard the word "Ayatollah" or "Shi'ie Moslems." Ironically, for the Iranians who resided in the U.S. prior to 1979, that absence of a universal image, was a blessing. By this I mean that they could define themselves individually because they were not yet typecast or stereotyped by the mass media. This is no longer true. In the past two decades, Iranians not only have acquired a negative image but, based on a recent national survey, have been mentioned as one of the most hated nationalities in the U.S.
"A more serious failing was the tendency to report events outside of any historical framework. At the outset of the crisis, the American people probably knew next to nothing about Iran and its history. While a better perspective on the cultural and political traditions of Iran would not have made the hostage seizure any more acceptable or justifiable, it might have made the episode more understandable and could have encouraged a calmer and more deliberate reaction. In particular, the hatred of the Iranians for the United States could be understood only against the background of gross and prolonged abuses by the Shah and the history of U.S. involvement with him, and this perspective too often was missing" (p. 27). According to James Bill (1988), Americans did not have information to foresee the revolution, nor did they have information to understand it. Rather than providing a context and explaining the history of American-Iranian relations, the media focused on sensationalism. Blindfolded hostages were shown on television repeatedly - in fact, this scene was incorporated into the opening collage of many television news programs in the United States. Images were essentially substituted for explanation and reasoning behind the unfolding events in Tehran. In fact, these images have been engraved in the psyche of those Americans who witnessed, mainly through television, that unfortunate event. Consequently, Iran lost its exotic, faraway, fairy tale image forever. In 1980, Iran and Ayatollah Khomeini received so much TV coverage that a Time columnist dubbed American television "Ayatollah Television" (Naficy, 1997. p. 80). In concert with television, motion pictures, newspapers, magazines, talk shows, recorded music, jokes, bumper stickers, buttons, dart boards, T-shirts, and toilet paper all trivialized Iranians. As if by magic, Tehran's temperature, Iran's currency, and "Iran," in general, disappeared from the rosters of newspapers and telephone directories. Even the sticker on the Persian Melon was replaced to exclude the world "Persian!" The name Iran became a curse. 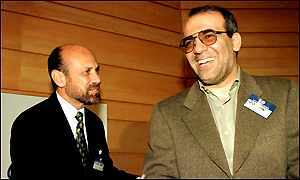 According to Hamid Naficy (1997), with the release of the hostages , the "hostage crisis" was transformed into a "hostage industry" (p. 81). Many of the ex-hostages became celebrities, writers, and speakers. The music industry released several anti-Iranian songs, including the relatively popular song, They Can Take Their Oil and Shove it. Hollywood found a new nemesis. Some of its stereotypical and anti-Iranian movies, include: Peacemaker (1997) in which a character, apparently without any context, says "f... Iran." In the The Hitman (1991), several mobs join together to demolish an Iranian mob operating in Canada. The movie not only reinforces the stereotypical images of Iranians as unreliable, dangerous, cruel, fanatical, yet -- as often is the case -- makes no distinction between Iran and other Middle Eastern countries. Belly dancing, an Arabic food, homus, and other cultural representations of the Middle East blend together to portray a region devoid of any diversity -- there is no cultural distinction between Arabs and Iranians, Turks and Kurds, or Saudis and Egyptians. In fact, on Friday, May 9, 1997, CBS aired an episode of JAG in which several Hamas [a Palestinian group] terrorists took a Washington hospital under siege. They spoke in fluent "Farsi" (or Persian) not "Arabic." Though Not Without My Daughter exploits the stereotype of the demonic Iranian, an idea with some political currency right now, it is not an exploitation film. It is, however, an utter artistic failure, and its reliance on cultural stereotypes is a major cause (pp. 13-14). Just recently, in an attempt to humiliate and demoralize the Iranian soccer team and its supporters, a major French television network, obviously knowing the highly negative impact of the film on viewers, aired it prior to the scheduled Iranian and American soccer competition at the 1998 World Cup. Madhouse (1990), partially centering upon a wealthy Iranian who is in the process of divorcing his American wife, is another damaging example. In one of the scenes, the wife, speaking to Ghadir (her Iranian husband) utters such insults as "you goddamn towel heads, sand rats" and so on. Other Hollywood movies that belittle and reinforce the stereotypical images of the Iranians, in a similar fashion, are: Naked Gun (1988), Under Siege (1986), The Delta Force (1986), Into the Night (1985), Down and Out in Beverly Hills (1985), Threads (1984), The Final Options (1983), Silver Bears (1978), and many made-for-TV features and docudramas such as On Wings of Eagles (1986) and Escape From Iran: The Canadian Caper (1981). Unfortunately, wars (whether faught by traditional weapons or modern weapons such as mass media) produce casualties. And in the contemporary war of images, the Iranians continue to suffer from a relentless attack from the U.S. politicians and the mass media. For instance, Iranian travelers are often singled out and searched at airports. Iranians face tough restrictions in obtaining visas to the United States either for touring, studying or visiting relatives. Discrimination against Iranians has increased in practically every sector of American society, including the U.S. Justice system. Strangely enough, in divorce cases involving marriages between Iranians and Americans, U.S. attorneys have often used Betty Mahmoudi's book, Not Without my Daughter, as "evidence" to prove that Iranian fathers are unreliable; hence, they should be denied any visitation rights with their own children. It is often believed that Iranian fathers may kidnap their children and take them to Iran: a backward, strange, and unruly country, as portrayed in books, newspapers, magazines, radio, television, and movies. In spring 1997, a San Francisco Bay Area radio talk-show host makes a number of offensive remarks against Iranians shortly after a devastating earthquake in northeastern Iran. Reportedly, in an on-the-air conversation with radio listeners, she comments that not only would she not send a penny to help the earthquake victims, rather, if she had the means, she would bomb Iran off the surface of the earth. According to Washington Institute for Near East Policy (1997), the U.S. government is to restrict visas to "students from terrorism-supporting states" such as Iran, Iraq, Libya, Sudan, and Syria who intend to study subjects "that could contribute to their countries' efforts to develop missiles and/or nuclear, chemical, or biological weapons." A Democratic Senator from California, Dianne Feinstein, has said, "I have grave reservations regarding the practice of issuing visas to terrorist-supporting countries and the INS' [Immigration and Naturalization Service] inability to track those who come into the country either using a student visa or using fraudulent documents" (Abrams, 1998). Legitimate security concerns aside, such official statements or policy matters become discriminatory when they intentionally single out only a few countries in the world and imply that every student or citizen of those countries would be a potential terrorist. As a case in point, a Washington Post reporter, Thomas Lippman (1995), in an article titled "Bogus Bills?" writes: "Those darn Iranians, will they stop at nothing? Sponsoring terrorism, trying to get nuclear weapons, printing fake $100 bills." Since the landslide victory of President Mohammad Khatami, in the 1997 Iranian elections, a window of opportunity has opened that may lead to a renewed and productive relationship between Iran and the United States. On January 7, 1998, in his address to the American people, via Cable News Network, President Khatami spoke knowledgeably and "admirably of American civilization, sprinkling his comments with respectful references to the Pilgrims and Abraham Lincoln" (The New York Times, 1998). In his interview with Christiane Amanpour of CNN, President Khatami remarked, "I have said earlier that I respect the great American people." He then continued to say that " The American civilization is worthy of respect. When we appreciate the roots of this civilization, its significance becomes even more apparent" (Transcript of interview, 1998). "To the people of Iran, I would like to say that the United States regrets the estrangement of our two nations. Iran is an important country with a rich and ancient cultural heritage of which Iranians are justifiably proud. We have real differences with some Iranian policies, but I believe these are not insurmountable. I hope that we have more exchanges between our peoples and that the day will soon come when we can enjoy, once again, good relations." So, for the first time in nearly two decades of hostilities between Iran and the U.S., Presidents Clinton and Khatami have begun to exchange friendly remarks. Furthermore, in February 1998, an American wrestling team participated in the Takhti Wrestling Cup contest in Tehran, and, in April 1998, an Iranian wrestling team participated in the World Wrestling Cup in Atlanta, Georgia. Ironically, according to Newsweek (Iran's soccer diplomacy, April 1998), "When American wrestlers competed in Tehran last February, they were treated like superstars... When the Iranian wrestlers came to America this month, they were detained, photographed and fingerprinted as potential terrorists in the Chicago airport" (p. 43). The next milestone in these renewed cultural exchanges took place when the Iranian and American soccer teams competed, quite admirably, at the 1998 World Cup in France, on June 21 in Lyon. As an American put it, "Certainly, better political and commercial relations can only lead to better social relations for Persians within the borders of both countries" (Walker, 1998). Of course, the key to building any successful relationship is "mutual respect." It is true that, historically speaking, no cultural group or nation has been spared from the abuses of scapegoating, stereotyping, or animosity at one time or another. But being aware of the consequences of such exploitation, should the mass media and politicians continue to stir up animosity, divisiveness, and hate? The answer, of course, should be a resounding "no." As we march toward the millennium, it is clearly evident that we now possess an array of highly sophisticated communication and telecommunication technologies that span the entire globe and, indeed, can be used to engender such basic and vital human values as mutual respect, heightened awareness, cultural understanding, cooperation, and sensitivity toward our fellow human beings (Kamalipour, 1996). Unfortunately, as illustrated throughout human history, such noble actions do not take place without prompting, prodding, and active participation in socio-poltical processes. For the purpose of this essay, I venture to alter the popular cliche "A silent minority is a forgotten minority" to "A silent minority is often an abused minority." Hence, it is imperative that we, the Iranian community in diaspora, realize the serious implications of our prevailing stereotypical images in the U.S. and elsewhere as they impact upon our social and political relations within the U.S. and other nations. We live in a world of images -- images that can sell as well as enhance and images that can conjure hate and despair. Although there is no magic formula for creating a positive image for our community and culture, we can learn from the successes of other ethnic communities in the U.S., such as Hispanics, Jews, Blacks, Japanese, and others, to confront the media and politicians in a constructive and organized manner. In terms of politics, of course, our votes and voices count. In terms of media, our letters, telephone calls, emails, and faxes are bound to have an impact when we act in a logical, organized, and collective manner. The fact is that an "Iranian image," whether negative or positive, touches all Iranians regardless of their social, economic, or political orientation. Finally, in 1928, W. I. Thomas and D. S. Thomas said: "If men define situations as real, they are real in their consequences." That comment is still valid. Today, public perception is largely based on mass media's portrayals of a particular group, nation, religion, or race. Similarly, reality is simply what people perceive to be real; in fact, "reality" may be totally fictitious.